Hello out there. Apologies, it has been a while since my last post. We are doing well. A few days ago we had a visit from my giant brother and his lovely wife. They were in Las Vegas for vacation and drove all the way to Arizona to visit us. It was so good to see them in person. My brother is so bright and fun to be with and his wife is his perfect match. We had a great time chatting. Thank you Ray and Andrea for taking the time (and the long hard drive) to see us. The kids were so happy to spend time with them, we got this great picture. Isabel is plugging away at school. She was accepted to Camp Kesem again this year, so we will be getting ready for that soon. Sebastian was accepted as a volunteer for the police department he is an Explorer with. He is so excited. He is also gearing up for the Explorers Police Academy happening soon. Sebastian has done well balancing theses activities and his classes. I am so glad he can see that he is making progress toward his goals. Esteban is keeping us all fed and laughing. He is so much fun to be around. I have settled into a schedule, I have chemo three times a month on Thursdays. It feels like I am handling it well. Everyone says I look better than last year during chemo and I think that is encouraging. Before the Easter break I was sneaking out to the movies and other public places once in a while. But Doc says because my immune system is suppressed, I have to limit my public outings so I can continue to handle chemo successfully. Boo. Other than that I am crafting up a storm and goofing around with my family and Luci. Thank you for your patience. I will try to pop in when I can to say hello. I have been doing a variety of crafts over the last few weeks and wanted to share some photos of them. I love to crochet and have been doing small projects. Here is a round coaster using this amazing multi colored yarn I bought last year. This is a flower shaped coaster using that same yarn. The colors change after long segments of certain combinations. Only problem is that I can't find the paper tag that went with it. That's ok, there are only a couple of places it could be from so I'll find it eventually, I would love to see if there is a blue version. I will definitely be using the yarn to make a few more small projects I know I will love. I really like coasters because they are quick and I have seen quite a few free patterns online that I can try. I used a tutorial on one of my favorite blogs Resurrection Fern to complete this little rock fish necklace. I made a few additional rock fish. I had to try a few colored ones too. They were very fun and easy to make. I used a tutorial I found on the really nice blog Speckless to make this multi-media rock. I first embroidered my message on a piece of muslin, then I crocheted the muslin to a stone to make a paperweight. You can vary the pattern of the crochet using doily stitches. This is the back, pretty simple. I wanted to make a token of love and it worked! Esteban liked his love rock. I am working on rocks for Sebastian and Isabel. I used my Mark-B-Gone pen to write the message on my bit of muslin first, the bright blue ink disappears with a little water. I embroidered Sebastian's already using his favorite color, you can see Isabel is still in Mark-B-Gone blue ink. The grey thread is to crochet Sebastian's rock and the dark red for Isabel's. I will show off the finished rocks soon. I am doing a few Swap-bot craft swaps that I am really excited about so I have a few deadlines. I will post more about Swap-bot soon too. At the very least I have to let you know that it has been so fun, I've had a great experience. It is one of those things that is what you make of it. Chemo was fine last week and the week before. It makes me feel a bit medicated and I tend to fall asleep in my chair pretty regularly. Usually with a ball of thread or yarn in my lap. My family is taking great care of me and Luci is a loving companion. I am looking forward to seeing spring in the trees along my walk. Soon. Last week Isabel had her Spring Choir Concert. I was not able to go in person but I was there in spirit and Esteban got a little video for me. I got a great snap of my beautiful baby before she left, a friend fixed her hair for her. Isabel had a small solo and she was so proud. The concert went well with lots of applause. Here is little Bella on the way to her concert. Isabel is wearing my shawl because it was a bit cold and she did not want a sweatshirt to ruin her outfit. I love her smile and am so proud of my lovely daughter. I am doing well on this round of chemo, my energy levels have been good. I have been able to hang out with my super cool family and craft up a storm. The weather here in Arizona has been warm, then cold and rainy then warm, then cold and rainy. It is a bounty of weather when we usually see clear skies. I love the variety and we are having fun taking little walks out to explore the wet park and neighborhood. Luci is less sure about the rain so we have to reassure her regularly that the sky is not falling. Our winter will end soon so we are enjoying the chill. On to the crafting storm! I have been inspired by several creative ladies and I want to mention them because they lift my spirits on a regular basis. One amazing creator is Geninne from Geninne's Art Blog. She takes her inspiration from nature and shares that regularly. Geninne taught me to carve stamps with the detailed tutorial available on her blog. She even wrote a book about carving stamps called Making An Impression. Geninne is an accomplished painter as well as a gifted photographer and she shares her work with a humble pride that I love. I recently found incredible crochet inspiration from a lovely lady named Lucy on her blog Attic 24. Her style is so vivid, she chooses the best color combinations and creates beautiful and fun crochet projects. I used her tutorial to create my tiny bunting and I also used her patterns to create tiny flowers, stars and hearts. Lucy's blog is full of unique crochet and beautiful photos of the English countryside where she lives. I love seeing what Lucy is up to, she inspires me to continue crocheting. I thank both Geninne and Lucy for the work they do to share their lives and their art. I feel like my crafting is better because of the influence of artists like these bright ladies. Let me show you what I've been up to lately. I've had the urge to work with clay, but since I am a novice I did not want to spend a lot of money on my first practice creations. I found this great air dry clay at Target of all places. It is Crayola brand clay that came in a nice size tub for just over $3. Yea! I wanted to make some small little dishes to hold my bits of nature, so I tried an experiment. I took bits of the clay that I warmed up in my hands and smooshed them against some medium size rocks. I like the way they turned out. You can sand the dried clay, but I liked the rough look with unfinished edges. I painted one silver and I like how you can see the texture of the rock, the rest are unpainted. The clay is a bit chalky but I liked it and will use it again. I crocheted this cute little grey bowl to hold my crochet stones. I crocheted this bowl and put one of those artificial candles inside, it makes a soft glow at night. The red thread I used for the flowers is called "Liberty", what a great name. The company that made the blue was not quite as creative with "Dark Blue". Funny. This is a leaf I made with a pattern from an online library book, I just can't remember which one. I love the Greater Phoenix Digital Library. I crocheted a few hearts, they are bumpy and will look nicer after a light pressing. I asked Isabel is she would like tiny heart bunting and she said "Only if they are black." So I am going to try some black hearts, I'll let you know how they turn out. I crocheted this tiny owl. I love the color of the yarn, it has brown, orange and green shades. Who? I made these clothes pins into tiny arrows for my bulletin board, they are sweet and add a bit of sparkle. I love small projects and have had a great time crafting these little things. I go again for chemo on Thursday, I get a little nervous a few days before, but everything always turns out fine. I hope your week is going along well and have a great Valentine's day. Take a look at my latest creation! I am taking the crochet up a notch! Yes I crocheted mini bunting! You can see that I am excited. It is a project I was not sure I could complete. I stuck with it and feel great about the way it turned out. I am not well enough to run the shop but I like sending people things so I joined Swap-bot. Basically you sign up to swap handmade art under a given theme. I joined a matchbox swap for February and sent it off yesterday. I included these crochet flowers in the package. I can't show a photo of the matchbox until my partner receives their package. I was so excited about my bunting I just had to share. I hope your week is off to a stellar start! Howdy! Just a quick update. My chemo is going well, with only occasional sickness. Doc says this round is really strong stuff so as long as my white cell counts stay good I will keep getting the maximum dose for my size. I just have to manage the side effects. I am having fun hanging out with my family, they take such good care of me. I am literally crafting away the blues. I've carved a few stamps and now I am trying different crochet patterns. Keeping my hands and mind busy helps me pass the time in such a positive way. When I finished a recent crochet project, I actually giggled with pride. There is such a boost that comes from creating something. I am using that to lighten my load and my life. So I leave trails of stamp shavings, paper scraps and bits of yarn but my family doesn't seem to mind, whew. So let's take a look at what my camera witnessed this week. My latest stamps. I love the tree and the camping lantern. I like the crocheting river rocks trend that I've seen online, I had to try it. I crocheted two glass stones as an experiment, I like the dark blue color. I've tried a few patterns on the rocks, so fun seeing how they turn out. I am going to leave a few of them at the park to give away. I enjoy nature. I love how the stones bring crafting and nature together. I even tried a pinecone cozy. Funny right. We've been eating a lot of fruit. The red fruit is Aujou pears. So good. When we go for walks, Esteban helps me pick up pieces of nature that inspire me. Here is my handsome husband near the community center and park where we walk. I wanted to take some pictures with two of my favorite nurses, but they were too busy. So here I am at the hospital getting the juice of life. I love the tiny tv's that are hanging on an arm. We can each watch what we want while we wait. I made the hat too, that orange color is one of my favorites. I leave you with a touch of Luci Love. I made that pillow and she keeps putting her head on it, she even twists around so she is positioned over it correctly. It is one of the cutest things I've ever seen. Our family is in a good rhythm as the winter rolls on. This is the best time of year for Arizona so we are enjoying the cooler weather. I just wanted to share a bit of what each of us is up to. He loves Dub Step music, he uses his phone and headset to rock out when he is cleaning or doing laundry. A few days ago I told him I was craving berries and he brought every berry at the store. Raspberries, blackberries, blueberries and he included grapes just in case. He hosted a berry festival for me, so amazing. Esteban and I love to watch some of the series TV on NetFlix and Hulu. Right now we are watching Being Human and the last season of Star Trek Voyager. He is finishing his finals and has been studying a lot. He took a break to see his High School friends in their production of Beauty and the Beast. He thought the play was outstanding, especially the young man who played Gaston. Sebastian misses his Drama and Stage Craft classes, they were his favorite in High School. When he has time, Sebastian watches episodes of The Walking Dead, he is so hooked. Is reading a lot and watching anime and horror movies with her friend Jamie. Isabel says she wants to visit Japan when she is older. She and her friends are trading beaded friendship bracelets. Isabel has also been putting her hair in a pony tail for several weeks, I asked why and she said she just feels like it. Preteen girls are fun to be around (most of the time;), I love to hear Isabel laugh. I have been doing a bit a embroidery, made a few trees and carved a few stamps. I seem to have the attention span of a hummingbird. Crafting keeps my hands and mind busy and makes me feel better. I can't get enough of Bones and The Amazing Race on Hulu. I have also been putting whipped cream on my fruit, it is my favorite thing to eat right now. I caught Isabel shooting the whipped cream into her mouth. See, most of the time. Luci has been living the good life receiving love from each of us. We had a day of rain and Luci was not sure at all about going out. She shakes her body like she is soaked every few minutes, so the rain walks are like a mad dash for Esteban and Sebastian. Fruit and whipped cream, my latest food love. This tree was a custom order finished yesterday. It was fun to try fewer stones on a slightly taller version of my Tiny Trees. I embroidered this fox which was a project in the book Embroider Everything by Diana Rupp. I made a wire frame and embroidered it to the fox, I like how it turned out. There we go, a little update. I hope you are having a great weekend. Happy Martin Luther King Jr. Day and Bald is Beautiful! We are having a great time as winter is winding down, I just wanted to share a few photos of what we are up to. Sebastian is wearing his Police Explorers Uniform after a national competition his unit participated in this past weekend (we are asked not to show photos of the patch because it says police). Sebastian completed a serious obstacle course and a separate mud run, which is a lot for a first year member. He is so excited to be part of a team and get to learn from and participate with the pros. He was giving us a blow by blow of his adventures and I caught this great shot. Luci has perfected the mid day nap after months of intense practice. A touching father daughter moment. We all give Luci air kisses as often as possible. We had a cold snap that lasted for several weeks and we would put this jacket on Luci for her early morning walk when the temperature was just above freezing. After a few days she would come over and sit by the jacket and wait for me to put it on. When it got warmer she stopped asking for it. I made the jacket last year using cozy flannel. Esteban wearing his Power Ranger hoodie on one of our walks. I love it, he is so cool he could really be a power ranger. The red one of course. A great tree along our walk that has circular leaves, one of my favorites. Other beautiful trees along our walk. I am playing with my carved stamps and having a coffee. I made that mobile with blue beads. I like how it turned out and am experimenting with designs for my next one. I picked up these twigs and rock on our walk and couldn't resist taking some photos with my newest stamps in the light box. I am getting more confident and trying designs that are a bit more complicated. I got this bright idea to make handles for my stamps. 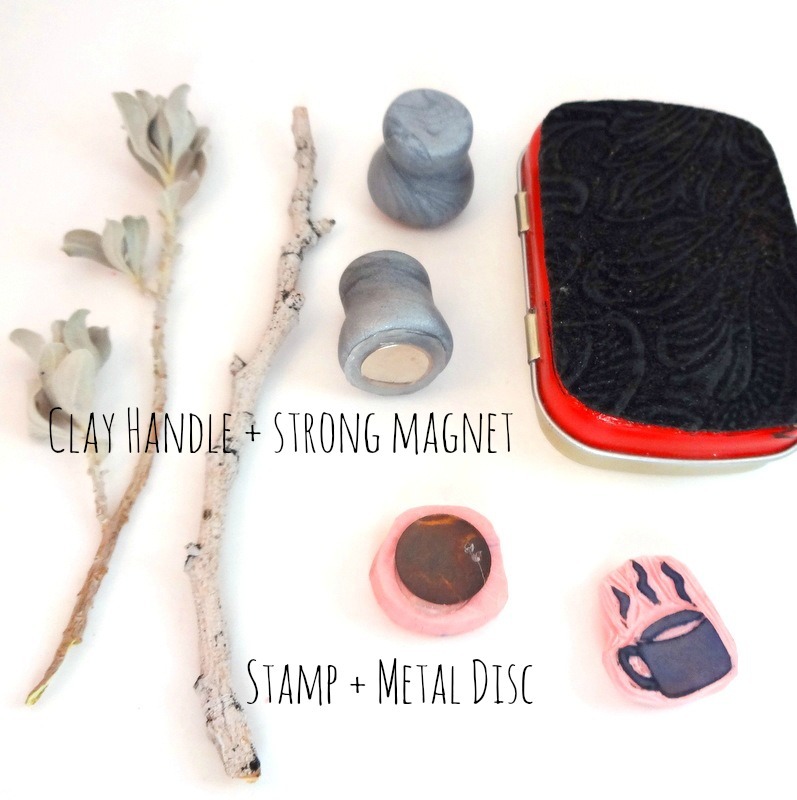 I made a few prototypes out of clay and used hot glue to add strong magnets. I glued metal discs to the back of the stamps. I tried them out and the handles worked like a charm. I was afraid the stamps would slip around, but the magnet was strong enough to keep the stamps in place when used. My hair is now coming out so we are taking the next step and shaving it. Here is my last photo of hair. So long. I hear bald is beautiful anyway. Hi, I'm Frances. I use this space to share about things I make, like or think about. My family is very special, so there will be plenty of embarrassing stories and pictures. I must also mention our super and beloved dog Luci. We are not able to stop taking photos of her, so there will be a ton of dog pictures. I am living with cancer so there will be mention of treatment, but it will not be the main focus of my blog. Welcome. This is my giant son and his friend BOB. 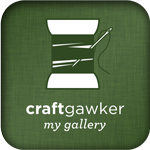 Click Here To See My Tiny Tree on Craftgawker! Click Here to See My Beaded Spider on Craftgawker! Background and header free from: http://www.backgroundfairy.com/. Ethereal theme. Theme images by Airyelf. Powered by Blogger.